If staying in houseboats in Kashmir is a great attraction for tourist visiting north India then a visit to Kerala Backwaters on India tour packages is incomplete unless you have not opted for staying in a Kerala houseboat. Matching with an extensive expanse of Dal Lake offering along with a natural flow of house boat in Kashmir then the long extended chains of canals that even goes in length upto 1500 Kms and interlinked to network of 44 rivers, lagoons and lakes are prefect stream and water bodies for Kerala houseboats. 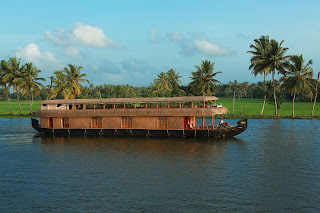 This vast expense of canals that you will observe on Kerala Backwater tours are sometimes are either man made or the other time are naturally formed water bodies that has been in use for constant support of traffic of men and materials even before the arrival of modern means of transport like land and air transport becoming being operational in Kerala. One such water transport form popular in the state was been known as 'Kettuvalloms'. They are wooden planks tied together with coconut ropes and painted with cashew nut oil from outside. They are 70 to 100 feet long and 15 to 20 feet wide. And it is that Kettuvalloms forms a basic platform for Kerala House boats. Thus cargo boats converted into present day houseboats are huge barges are actually now -a -days are being used for leisure trips on Kerala Backwater Tours. In earlier times, a single Kettuvallams had the capacity to carry out tons of rice and spices. A Kerala houseboat can bear weight upto 30 tons. To offer a comfortable stay during India tour packages a part of traditional Kettuvallam gets converted into a restroom and Kitchen with the help of bamboos and coir. Meals are cooked on board from freshly cooked fishes obtained from the backwaters. Present day houseboats have all the means of modern luxury for visiting traveller. They are fully equipped with furnished bedrooms, modern toilets, cozy living rooms, a kitchen and even a balcony for angling. As the most of the boats are poled by local oarsmen, some are powered by a 40 HP engine. Boat-trains – made by joining two or more houseboats together are also used by large group of visitors and tourists. Made in unique design using local and eco-friendly materials like bamboo poles, coconut finer ropes, bamboo mats, carpets etc., these Kerala Houseboats have single room, double room, triple room accommodated with private balcony with comfortable chairs. 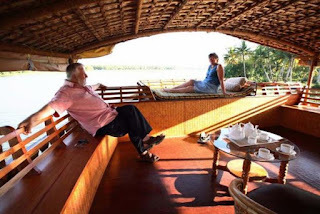 On Kerala Backwater Tours you will see a perfectly balance of man and nature while staying in Kerala Houseboats.